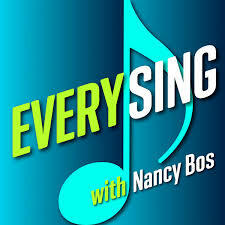 Our special guest, Nancy Bos is a singer, voice actor, voice teacher, published author and podcast Host of Every Sing Podcast ! She shares her passion for all things singing and shares the inspiration and motivation for her new book - The Teen Girl's Singing Guide. Your passion for music and singing is undeniable, but you don't know what direction to go! This book will help you find your path and outline steps you can take to make singing the focus of your life. Nancy Bos speaks real to teen girls about how to BE a singer. This illustrated book and journal lets teens explore all of the options including (and way beyond) being a pop star or professional singer. This is also a book for parents who want to understand the complex and vital relationship of music and singing and how it empowers our daughters. The Teen Girl's Singing Guide is personal, profound, and surprisingly practical!” -Cynthia Vaughn, performer/voice teacher/author Girls passionate about singing finally get answers to big questions, like "How can I be less nervous?" and "Should I study music in college?" These and many more topics are covered in this brand new book by Nancy Bos and her guest authors, discussing issues such as TV Singing Shows, Skype Lessons, and Performance Anxiety. Nancy helps girls follow their hearts and also their heads as they make decisions about their futures. This book is a must have for any teen girl considering singing as a career or hobby. Girls, your passion for music and singing is undeniable, but you don't know what direction to go! This book will help you find your path and outline steps you can take to make singing the focus of your life. Nancy Bos, a singer, voice actor, and voice instructor, has introduced the joy of singing to people all over the world with her lessons, books, and podcast. Bos has loved singing since she grew up in South Dakota and later in Iowa and New Mexico. She’s always preferred singing and acting with others. “You have so much more joy and emotional intensity with a group than alone. You get into the harmonies or the character with your voice and it is like you are a piece of the puzzle - a puzzle that can’t be completed without you. You move sound around. You give it life. It is hard to have a bad day when you’re painting with your voice." Bos enjoys being a voice instructor as much as singing and narrating. She sings at her Bellevue, WA church most Sundays. She also has a few songs available on Spotify and YouTube. Her voice studio and audiobook services do so well she always has waiting lists - a nice problem to have. She’s a board member for the Eastside Vocal Federated Music Club and serves as Northwest Regional Governor for the National Association of Teachers of Singing. She teaches and records at her independent studio in Bellevue. With her kids now grown, Bos says she loves the opportunity to share music with others and encourage them to follow their dreams.